I love scalloped potatoes. I would love a recipe to make them like they do at Texas de Brazil. I tried this recipe and it was pretty good, not Texas de Brazil, but delicious! I found the recipe here. 2 teaspoons of kosher salt, flakes (I just used freshly ground sea salt. 2. Spray the bottom and sides of a 9 x 12 inch baking dish with non stick cooking spray. 3. Place the cream, half and half, salt, and pepper into a heavy sauce pan and bring to a simmer over medium high heat. 4. Place the jalapeno, leeks, and cheese in a large mixing bowl and mix well. 5. 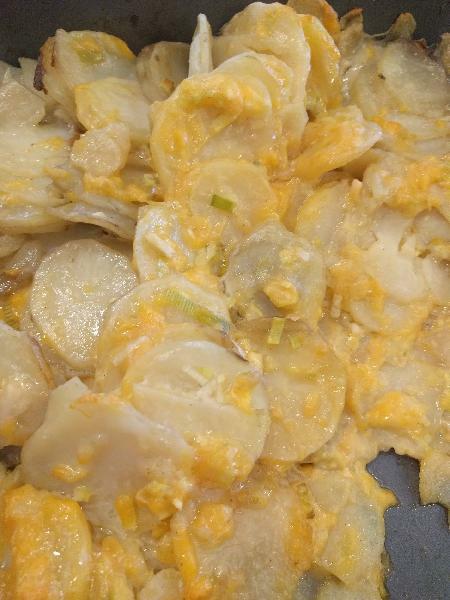 Add the potatoes and mix. 6. Spread the potato mixture evenly in the prepared baking dish. 7. Cover tightly with foil and bake for 45 minutes. 8. Remove the foil and bake for 15 minutes or until browned and the potatoes are tender. Description: A great side dish!